"We must not confuse dissent with disloyalty." Edward R. Murrow has become the de facto patron saint for broadcast journalism, and it's frightening to imagine what the broadcasting industry would do to him today—ship him off to NPR or something, probably. It may be difficult for many to believe, but at one time news on TV was more than just a great joke—it wasn't always this week's trial of the century, or the missing anonymous blonde, or the latest misfortunes befalling celebrities from the A list and on down the Hollywood food chain. Murrow wasn't wholly pure, though, and did more than his share of puffery�his interview show Person to Person is the necessary antecedent to such hard-hitting broadcasts as Entertainment Tonight and the E! network. 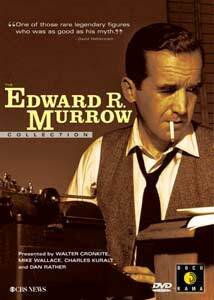 Still, his more important and lasting legacy has to do with his work as a newsman on the front lines, and this four-disc boxed set is a valentine to Murrow and his time; the contrast with what passes for news these days, even at Murrow's beloved CBS, couldn't be more stark. The late Charles Kuralt is our host for Disc 1, a modestly repackaged two-part documentary produced originally for PBS's American Masters series, called This Reporter. The focus is solidly on Murrow's work, with just a few passing mentions of his life, just the way the man himself would probably like it. As CBS's only employee in Europe in 1938, Murrow of necessity took to the air, and soon became the voice of the war and especially of the London blitz for American radio audiences. After the war, Murrow soon realized that radio would be eclipsed by television, what he saw as possibly the greatest teaching tool of all time. These were the salad days for the news division at the Tiffany network, and William S. Paley was happy essentially to give Murrow and his boys a blank check, to pursue stories as best they saw fit. Murrow's Christmas in Korea brought home the war on TV in much the way that his London broadcasts did on radio; the fulcrum of Murrow's broadcast career, certainly was his 1954 report on the methods of Sen. Joseph McCarthy, on See It Now. In truth, Murrow may have been a little late to the party, as McCarthy may have been past his zenith by then; still, the clips of these heavyweights going at it remains some remarkable television. It also brought with it too much attention, from Paley's standpoint; Murrow gradually lost status at the network, reduced to interviewing celebrities from their living rooms, eventually leaving CBS to run the U.S. Information Agency in the Kennedy administration. All those cigarettes finally caught up with Murrow; the documentary ends with students at a high school named for the broadcaster watching a Murrow documentary, demonstrating that his work stands the test of time. Better than the high school students, though, are the legions of broadcasters from another age reminiscing about their colleague and mentor—some, like Kuralt and Eric Sevareid, are no longer with us; others, like Tom Brokaw and Dan Rather, have moved along in their careers, but each of them seem very much self-consciously modeled on Murrow. Mike Wallace serves as host for Disc 2, The Best of See It Now, with a dozen or so extended clips from Murrow's signature broadcast, which aired from 1951 to 1958. What's fascinating is watching the host and his crew experiment with the possibilities of the new medium—Murrow is transfixed, for instance, on the series premiere, with the ability to have a monitor providing feeds from both New York and San Francisco, the chance to look at the Atlantic and the Pacific simultaneously. In truth, however, though Murrow's broadcasts always seemed to display a high level of intelligence, there's plenty here that seems a little pedestrian or dumbed down for TV, things that are notable and included no doubt not because they were the best, but because they were the first. These include a few sequences on weather events�looking into the eye of a hurricane, for instance, or documenting the flooding of the Missouri River�which would be right at home on the breathless coverage of current meteorological events on 24-hour cable news today; and fawning celebrity profiles (here of Grandma Moses and Louis Armstrong) which anticipate the voluminous fatuous journalism that followed. The unspoken but disappointing inference here is that, though See It Now was the favored child, the star-driven Person to Person was more popular. Continuing to have the brightest lights at CBS News pay their respects, Walter Cronkite hosts Disc 3, The McCarthy Years, detailing the heavyweight bouts between Murrow and the junior Senator from Wisconsin. The opening stanza is an October 1953 report on Milo Radulovich, an Air Force officer whose status in the armed forces was jeopardized by anti-Communist hysteria; Radulovich's sister had attended some meetings of Communist organizations, making Radulovich himself a poster boy for guilt by association. But this was merely the warmup bout for Murrow's March 1954 broadcast, in which the newsman took McCarthy on, calling him out for his lies, his inappropriate and misleading innuendos, his bullying tactics and his questioning the loyalty and patriotism of those with the temerity to disagree with him. It remains today a paragon of advocacy journalism, in the very best sense. McCarthy confirms all of Murrow's points with his response on the CBS airwaves, some three weeks later; Murrow invites history to judge, and the reporter stands the test of time far better than does the legislator. Finally, on Disc 4, Dan Rather introduces Harvest of Shame, Murrow's Thanksgiving 1960 installment of CBS Reports on the appalling conditions facing American migrant workers, slaves in all but name, "a 1960 Grapes of Wrath," as Murrow puts it. It remains affecting for a number of reasons: it's unlike anything aired on broadcast networks today, demonstrating intelligence, compassion, and a point of view; and it can't be as easily historicized as the McCarthy footage. It's easy to watch Disc 3 and think, Well, thank goodness those times have past. You can't say the same about migrant workers, though, and Murrow's broadcast retains much of its relevancy. Image Transfer Review: The Murrow broadcasts themselves have been badly abused by the years; the newer interview footage is heavy on contrast. Audio Transfer Review: All reasonably audible, though again, with the archival stuff, quality varies from clip to clip. Extras Review: Each of the four discs includes the identical Murrow biography, and a Docurama catalog with a couple of trailers. TV news is generally so sorry these days that it's easy to go overboard when talking about the good old days; Edward R. Murrow wasn't a saint, and he did more than his share of puff pieces on movie stars and the weather. But he understood as well and as early as anyone the power of images on television, and he harnessed that power to his efforts to inform and enlighten; this four-disc set is a worthy tribute to the man and his work, and we'd all be better off if Murrow's successors heeded more of the lessons from the great man today. Good night and good luck.